Nick Clegg. Clapping or praying? This winter was one of the coldest and deepest for a long time. Snow fell, and stayed. Even now we have only had a few weeks respite from an otherwise permafrosted year. For political pundits, however, there was one event anticipated which was going to introduce exciting change into our lives: the British general election, 2010. But even here, despite the white-hot molten suspense the media have attempted to stoke for months now, well, the end result looks more like more of the same. In lieu of any real shift in social forces underlying the representative system we have had a predictably samey result to what has come before. A widely discredited and despised NuLab government has been punished with a hung parliament, of which they could possibly hold on to power in coalition with the Liberal Democrats. But let’s leave that aside. What I want to list are the sheer levels of unfufilled popular notions about this election. All the things which were promised, then never delivered on. Cleggamania. 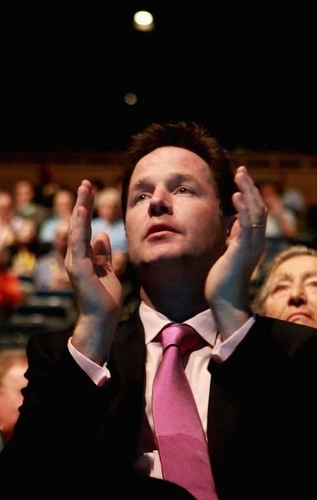 Cleggmania may be the most chimeric social phenomenon in recent history. Whilst he was meant to have to have blown open the race, and reconfigured all the existing electoral coordinates, in the end the Lib Dems did hardly any better than the last election. BNP breakthrough. The BNP—that terrible bogeyman compelling honest Joe six-pack dissillusioned with all the mainstream parties to vote in any case—they in fact gained none of the seats they fielded candidates for. Their share of the vote went up, but there was no decisive swing to them. The Big Society New Tories. The Big Society idea inspired by the Phillip Blond red Tory faction fell totally flat. No one knew what the big society was; no one cared. The Tories would probably have done better just sticking to a more blatantly neo-Thatcherite position. Fact is, the whole battle of ideas promoted by the media—vacuous differences over how to phase in cuts, political villains, gibberish ideologies, and so on—never conferred to the interests of any real social forces. It remains the case that if you want to see any real political change, it will only come from changing the objective alignments of deep social forces and social blocs. Whilst liberal pundits—The Guardian newspaper as the primary repository for such sentiment—continue to believe that simply triangulating interesting ideas and showy rhetoric represents a way forward, the advantage Marxists have is to understand exactly why this fails, when others are simply scratching their heads in disbelief.